Contractor Balfour Beatty has hailed the ‘lasting legacy’ of the Norwich Northern Distributor Road, which is now fully open. 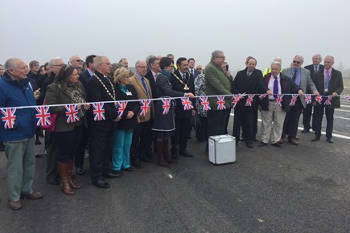 Following construction difficulties and a large cost increase on the project, the remaining 5.25km section of the A1270 opened on Tuesday morning (17 April). The £205m road – now named Broadland Northway – aims to improved access across Norfolk and alleviate congestion around the city of Norwich. The scheme has seen the delivery of nearly 20km of dual carriageway including the construction of 13 roundabouts and eight bridges. Balfour Beatty said that throughout construction the scheme has created on-going benefits for the environment such as the creation of 29 balancing ponds to store water run-off from the new road, seven bat bridges, wildlife ponds planted with native aquatic and marginal plants, and new homes for wildlife in the form of hibernaculums, owl boxes and bat houses. It said the scheme has also created a lasting legacy within the local community, with its team of 17 STEM (Science, Technology, Engineering and Mathematics) ambassadors attending schools and colleges across Norwich to educate young people on the vast number of career opportunities available within the construction sector. Phil Clifton, managing director of Balfour Beatty’s highways business, said: ‘We are delighted that the Broadland Northway is now open to traffic and the local community can experience the extensive benefits of the scheme. ‘While the project was not without its challenges, we have deployed innovative solutions to safely deliver the route, which has created a positive legacy for the environment and the Norfolk community in the form of skills development and education for local young people. Martin Wilby, chairman of Norfolk County Council’s Environment, Development and Transport Committee, said there had been no lack of effort to overcome the setbacks, but that completing the road safely and to a high standard had rightly been the priority for the joint Balfour Beatty and county council construction team. He described the road as ‘an important piece in Norfolk’s infrastructure jigsaw that will help secure a better, brighter and more prosperous future for Norfolk'. Norfolk CC said that although the main carriageways are now complete, work will be continuing on the surrounding areas, including some drainage lagoons, verges, cycle tracks and bridleways. Later in the year lane closures will be necessary on some parts of the route to repair damage caused to bare earth banks by wet weather. These banks will stabilise as the meadow mix seeding and other planting becomes established. Traffic management will also be needed later this year to complete permanent sound proofing on the bridge over the Norwich to Sheringham railway. Temporary measures will remain in place until then. In addition, wet weather limited access to some sites, and others were either completed too late to be planted this season or are still being worked on. Planting will resume in the autumn. The council is still putting the cost of the project at £205m. In 2015, £29.9m had to be found to advance the scheme after the cost rose from an estimate of £148m in 2013 to the target cost of £178m.